In the following guides you can find tips and best practices how to cope with some common tasks. While searching this page for particular keywords can give you quick results, reading the whole section should help you to learn some of the Dredd’s core concepts and usual ways how to approach problems when testing with Dredd. Requests in the API description usually aren’t sorted in order to comply with logical workflow of the tested application. To get the best results from testing with Dredd, you should ensure each resource action (API Blueprint) or operation (OpenAPI 2) is executed in isolated context. This can be easily achieved using hooks, where you can provide your own setup and teardown code for each HTTP transaction. You should understand that testing with Dredd is an analogy to unit tests of your application code. In unit tests, each unit should be testable without any dependency on other units or previous tests. Common case is to solve a situation where we want to test deleting of a resource. Obviously, to test deleting of a resource, we first need to create one. However, the order of HTTP transactions can be pretty much random in the API description. To solve the situation, it’s recommended to isolate the deletion test by hooks. Providing before hook, we can ensure the database fixture will be present every time Dredd will try to send the request to delete a category item. Often you want to test a sequence of steps, a scenario, rather than just one request-response pair in isolation. Since the API description formats are quite limited in their support of documenting scenarios, Dredd probably isn’t the best tool to provide you with this kind of testing. There are some tricks though, which can help you to work around some of the limitations. API Blueprint prepares direct support for testing and scenarios. Interested? Check out api-blueprint#21! 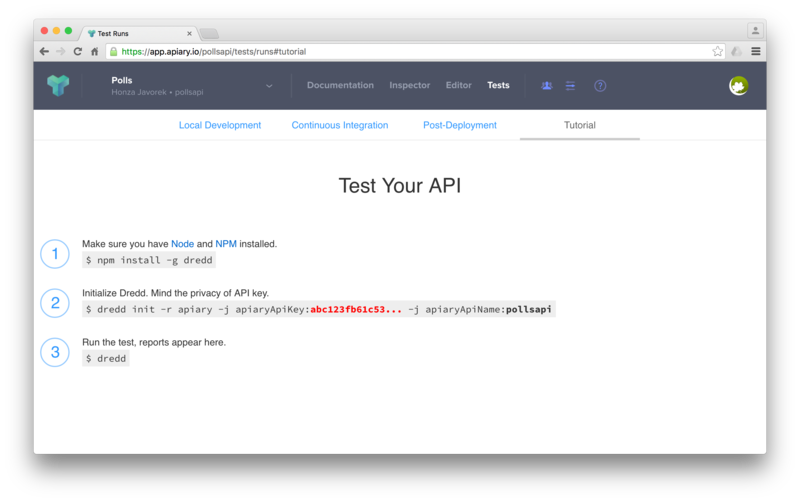 To test various scenarios, you will want to write each of them into a separate API description document. To load them during a single test run, use the --path option. For workflows to work properly, you’ll also need to keep shared context between individual HTTP transactions. You can use hooks in order to achieve that. See tips on how to pass data between transactions. API Blueprint or OpenAPI 2 files are usually created primarily with documentation in mind. But what’s enough for documentation doesn’t need to be enough for testing. That applies to both MSON (a language powering API Blueprint’s Attributes sections) and JSON Schema (a language powering the OpenAPI 2 format and API Blueprint’s Schema sections). In following sections you can learn about how to deal with common scenarios. It’s because in both MSON and JSON Schema additional properties are not forbidden by default. In API Blueprint’s Attributes sections you can mark your object with fixed-type (spec), which doesn’t allow additional properties. In API Blueprint’s Schema sections and in OpenAPI 2 you can use additionalProperties: false (spec) on the objects. It’s because properties are optional by default in both MSON and JSON Schema and you need to explicitly specify them as required. In API Blueprint’s Attributes section, you can use required (spec). That’s because in MSON, the default behavior is that you are specifying what may appear in the array. In API Blueprint’s Attributes sections you can mark your array with fixed-type (spec), which doesn’t allow array items of a different structure then specified. In API Blueprint’s Schema sections and in OpenAPI 2 make sure to learn about how validation of arrays exactly works. If the size should be always equal to 300, you need to specify the fact in your API description. In API Blueprint’s Attributes sections you can mark your property with fixed (spec), which turns the sample value into a required value. You can also use enum (spec) to provide a set of possible values. In API Blueprint’s Schema sections and in OpenAPI 2 you can use enum (spec) with one or more possible values. Generally, if you want to add Dredd to your existing test suite, you can just save Dredd configuration in the dredd.yml file and add call for dredd command to your task runner. To find more, search for dredd in your favorite language’s package index. It’s a good practice to make Dredd part of your continuous integration workflow. Only that way you can ensure that application code you’ll produce won’t break the contract you provide in your API documentation. Dredd’s interactive configuration wizard, dredd init, can help you with setting up dredd.yml configuration file and with modifying or generating CI configuration files for Travis CI or CircleCI. If you prefer to add Dredd yourself or you look for inspiration on how to add Dredd to other continuous integration services, see examples below. When testing in CI, always pin your Dredd version to a specific number and upgrade to newer releases manually. title: "Testing 'multipart/form-data' Request API"
x-example: "test equals to 42"
title: "Testing 'application/x-www-form-urlencoded' Request API"
The API description formats generally do not provide a way to describe binary content. The easiest solution is to describe only the media type, to leave out the body, and to handle the rest using Hooks. In hooks, you can populate the request body with real binary data. The data must be in a form of a Base64-encoded string. Do not use the explicit binary or bytes formats with response bodies, as Dredd is not able to properly work with those (fury-adapter-swagger#193). For details on this topic see also How Dredd Works With HTTP Transactions. In case you need to perform particular request with different URI parameters and standard inheritance of URI parameters isn’t working for you, try modifying transaction before its execution in hooks. As you can see on the screenshot, the test reports are anonymous by default and will expire after some time. 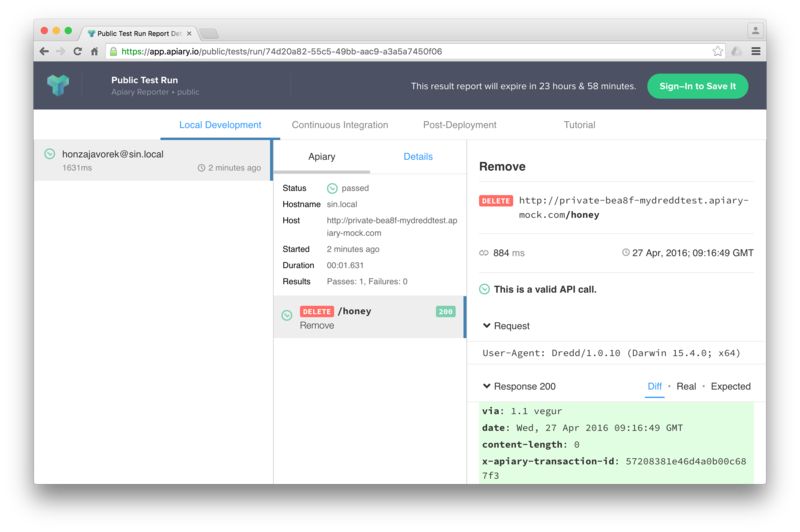 However, if you provide Apiary credentials, your test reports will appear on the Tests page of your API Project. This is great especially for introspection of test reports from Continuous Integration. APIARY_API_KEY=<Apiary API Key> - Alternative way to pass credentials to Apiary Reporter. APIARY_API_NAME=<API Project Subdomain> - Alternative way to pass credentials to Apiary Reporter. While example values are natural part of the API Blueprint format, the OpenAPI 2 specification allows them only for body request parameters (schema.example). The x-example property is respected for all kinds of request parameters except of body parameters, where native schema.example should be used. Be sure to read section about security first. Only the transaction.test (docs) object will make it to reporters. You don’t have to care about sanitation of the rest of the transaction (docs) object. The transaction.test.message and all the transaction.test.results.body.results.rawData. *.message properties contain validation error messages. While they’re very useful for learning about what’s wrong on command line, they can contain direct mentions of header names, header values, body properties, body structure, body values, etc., thus it’s recommended their contents are completely removed to prevent unintended leaks of sensitive information. Without the transaction.test.results.body.results.rawData property Apiary reporter won’t be able to render green/red difference between payloads. You can use Ultimate ‘afterEach’ Guard to make sure you won’t leak any sensitive data by mistake. If your hooks crash, Dredd will send an error to reporters, alongside with current contents of the transaction.test (docs) object. See the Sanitation of Test Data of Transaction With Secured Erroring Hooks example to learn how to prevent this. You can use this guard to make sure you won’t leak any sensitive data by mistake. If your hooks crash, Dredd will send an error to reporters, alongside with current contents of the transaction.test (docs) object. If you want to prevent this, you need to add try/catch to your hooks, sanitize the test object, and gracefully fail the transaction.